Cell counting involves identifying the boundaries of the cells of interest in three dimensions. Decide on a unique point (the characteristic point) that can be identified for each cell. This can be the top of the cell, i.e., the first part of the cell to come into focus while focusing down through the tissue, or perhaps the top of the nucleus, or even the nucleolus if the cells being examined have only one nucleolus per cell. The unique point must be visible for each cell to be counted. At each investigated microscopic field, an unbiased counting frame consisting of two exclusion lines and two inclusion lines is placed on the section. 1. Any point that touches the exclusion line, crosses the exclusion line, or is outside of the counting frame is not counted. 2. For any point that is still a valid candidate and that is a) inside the counting frame, b) touching an inclusion line from either inside or outside the counting frame, or c) crossing the an inclusion line, remains a candidate to be counted. 3. If an object touches or crosses both an inclusion line and an exclusion line, it is not counted (as per rule #1 above). 4. Restrict your analysis to a virtual space within the section thickness. 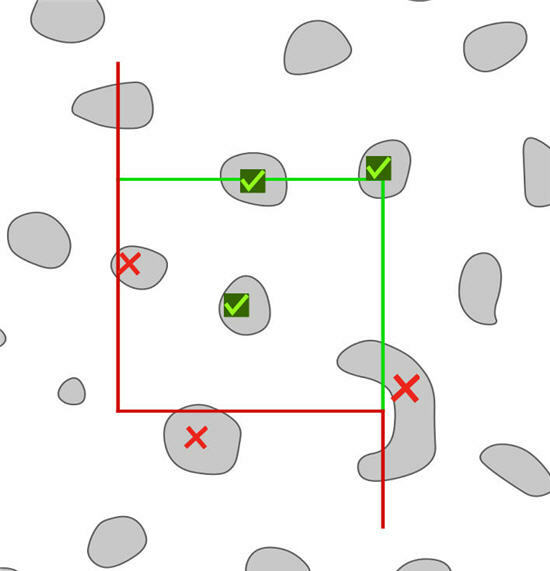 For any cell that is a valid candidate, count it only if its unique point– in addition to its position relative to the unbiased counting frame (as per rules 1, 2, and 3) – comes into focus within this virtual space. 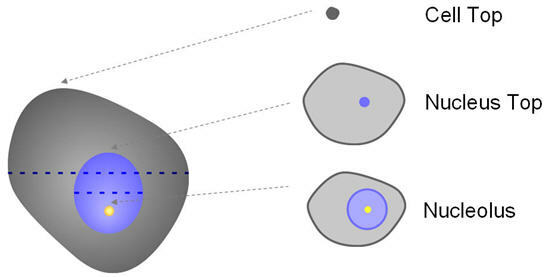 In other words, a cell is counted only if its unique point is found within an unbiased virtual counting space. Figure 2. An object is counted if it lies completely inside the counting frame or if it crosses a green (inclusion) line but not a red (exclusion) line.